LaLiga has officially unveiled its OTT (over-the-top) service, LaLigaSportsTV, which offers fans free coverage of live Spanish sporting competitions via mobile and connected devices. This service, designed by LaLiga, will boost the visibility and exposure of all Spanish sport, with matches also to be made available internationally via a catch-up service. Through this platform, LaLiga aims to support the development of audio-visual offerings for sports that do not receive coverage through traditional media channels and whose content distribution has been limited for fans, the company said in a statement. LaLigaSportsTV was created with the sports fan experience in mind. This has resulted in a simple and accessible interface, featuring native applications, cloud-based HD content and the ability to customise content for both live and on-demand services. Fans of Spanish sport living outside of Spain will be able to watch matches on demand after the live broadcast has ended, pending local rights restrictions. The LaLigaSportsTV app is available in eight languages (English, Spanish, German, French, Italian, Portuguese, Russia and Indonesian) for smartphone and tablet, while the smart TV service can be accessed in English and Spanish. This service sees LaLiga strengthen its commitment to the sporting federations as a part of the LaLigaSports project, which was created to offer sporting federations in Spain enhanced exposure, help with their development and boost their motivation to compete. Federations will also be able establish a new framework through which to reach their fans through the service. LaLiga is keen to assist the federations in gaining a better understanding of user consumption habits with a view to developing improved commercialisation strategies as far as audio-visual content and sponsorship are concerned. LaLigaSportsTV is a central part of the league’s commitment to innovation and to be at the forefront of technological advances, particularly in the audio-visual field. LaLiga is the first major European league to roll out its own OTT service and offer fans a platform for niche sports. This product is the only one of its kind globally and demonstrates the leading role played by the LaLiga clubs. 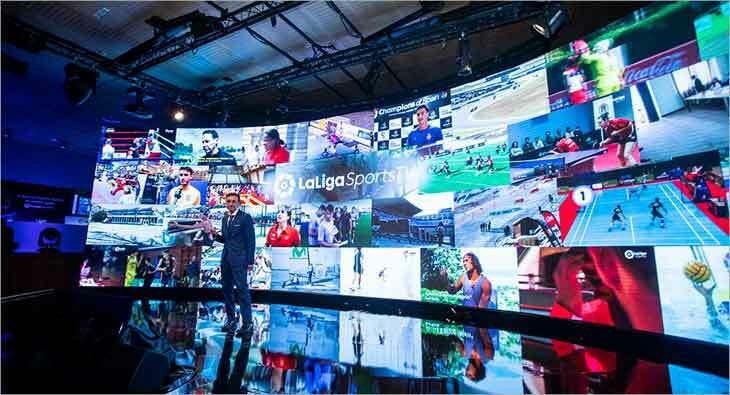 The launch event for LaLigaSportsTV was attended by LaLiga President, Javier Tebas; the President of the Spanish Sports Association (ADESP), Jose Hidalgo; the Corporate Vice-President of Samsung Electronics Iberia, Celestino Garcia; the Captain of the Spanish rugby sevens team, Paco Hernandez; as well as several elite athletes from Spain including Carolina Marin, David Cal, Joana Pastrana, Jeronimo Garcia, Jose Javier Hombrados and the full Spanish rugby sevens team. LaLigaSportsTV will now be promoted through an advertising campaign with the message 'Cuando te miran, lo das todo' (When you're being watched, you give your all), conveying that greater numbers of spectators have a direct impact on an athlete's performance levels. At the beginning of the event a minute’s silence was observed for Marcos Garrido Beltrán, a motorcyclist who died yesterday in an accident in the Andalusia Supersport 300 championship race at the Circuito de Jerez track. LaLiga sends its deepest condolences to Marcos’ family and friends. Talking about the service, Javier Tebas, President of LaLiga, said, "The aim is to offer less high-profile sports greater and improved visibility via a platform where content is quickly and easily accessible, allowing fans to enjoy their favourite sport wherever, whenever and however they want." Jose Hidalgo, President of the Spanish Sports Association (ADESP), said, "LaLigaSportsTV is a platform that will bring about a digital transformation and will offer exposure to the work carried out by each of the Spanish sporting federations." Paco Hernandez, Captain of the Spanish Rugby Sevens team, "It makes us proud to sport the logo of a brand as prestigious and representative of Spain as LaLigaSports. Now with LaLiga's new OTT we're convinced that rugby and the rest of the sports will enjoy greater visibility, which will also help our federations when it comes to securing new sponsors." Celestino Garcia, Corporate Vice-President of Samsung Electronics Iberia, said, "Samsung is the world's leading technology company and one which always seeks to link up with the best partners. Technology and content are increasingly related and that's why we were keen to be a part of the LaLigaSports project. It will allow our clients to access the very best in sporting content via their television sets, smartphones and tablets. We're delighted to continue to offer innovative solutions to a partner of LaLiga's standing."